Considering that any project on a boat usually uncovers unexpected tasks to complete it properly, we have made good progress the past few days. Forman Magnus has been keeping a close eye on us as he is anxious to get out to what we assume he thinks of as ‘frisbee island’ for a swim and some frisbee fetch on the beach (Frisbee Island is really Beckwith Island). 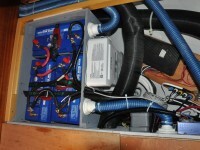 Our boat is equipped with a Volvo-Penta sail drive instead of the more traditional prop shaft. 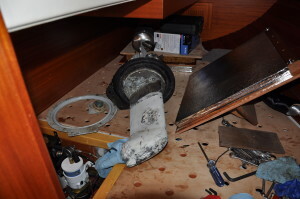 Unfortunately with this arrangement they put a big hole in your boat and seal it with a thick rubber gasket…and recommend it be changed every 7 years. Seeing as ours is 15 years old, we figured we should be proactive. So here is the drive leg and and transmission in the aft cabin. 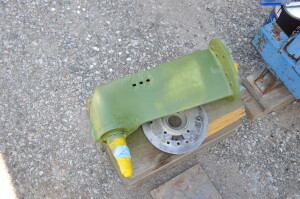 As our drive leg is also suffering from some corrosion that was presumably caused by stray currents before we bought the boat, it only makes sense to try and get a new coat of primer and paint to protect it. So I removed the leg from the transmission and took outside to work on it. Strangely enough the top of the leg was coated in VC-17 bottom paint which is loaded with copper. This is not good to put on aluminum as it can add to corrosion issues if the primer ever gets compromised. I’m actually rather surprised that Hallberg-Rassy would do this in the first place. 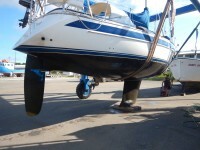 How many saildrives actually make it through their life without getting a scratch on them? Anyway, it is gone now. 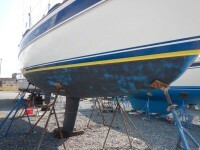 If anyone needs a quart of Trilux antifouling paint for aluminum boats, let me know. I think I only used 2 or 3 tablespoons. 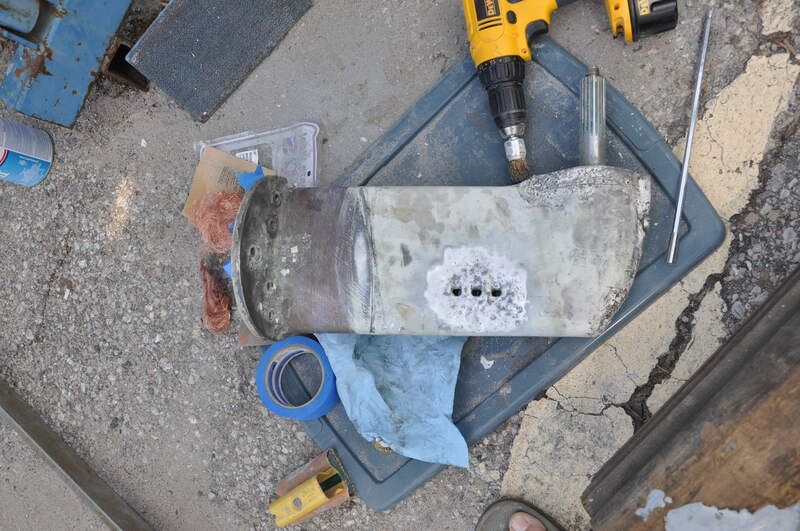 Cleaning up the drive leg was much more work than anticipated and of course some of the internal water channels were showing signs of the primer bubbling. It takes some imagination (or maybe some choice words and hours of frustration) to clean a triangular tube nearly 15″ long if you want to at least pretend to convince yourself that your primer will stick for more than a week or two. 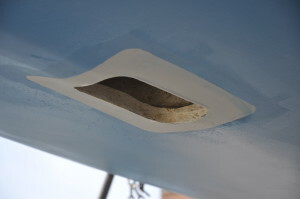 It would have been a lot quicker just to fibreglass the hole in the hull where the drive leg comes through. Who needs an engine anyway? Plus diesel is up 7-8% over last summer. While I was cleaning the saildrive up and convincing myself that any future boat will have a prop shaft and a dripless seal, Chrissy put the coat of black bottom paint on. Same paint as the blue, but this way when the black starts wearing away and revealing blue, we will have an idea how soon we need to repaint. 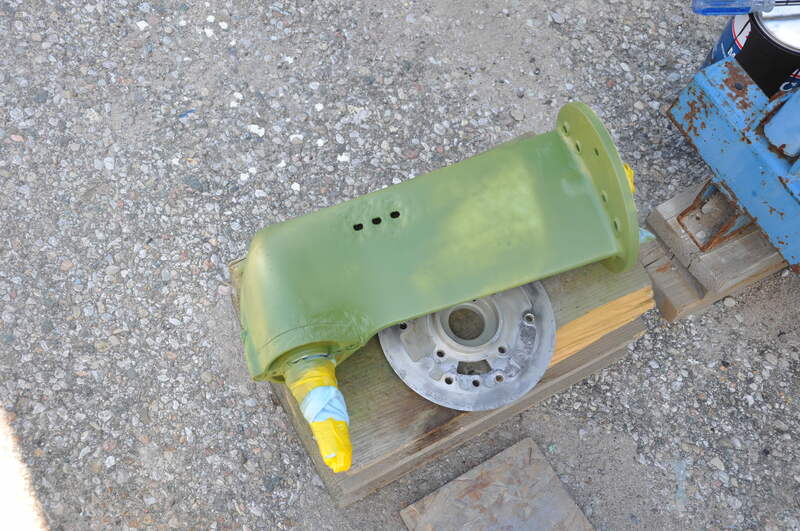 The zinc-chromate primer for the sail drive is a lovely army green. 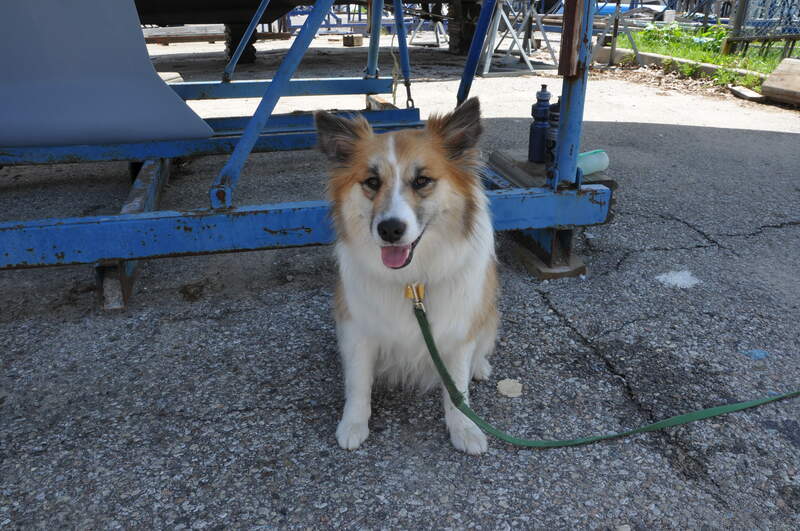 Not worry though, Mom, It is now a nice white colour so you need not worry about us having such a hideous thing on the boat. Hopefully tomorrow it all goes back together as nicely as it came apart.